The Sonoma State softball team has had some major remodeling. After having seven graduating seniors, many of whom were starters, the team had multiple positions to fill and players to replace. The softball team picked up five new freshman and four new transfer students. The Seawolves also had to find a new Assistant Coach after Andrew Rich accepted a coaching position at Boise State University. This position was soon filled by Shelly Prochaska, a former CSU Bakersfield assistant coach. Coach Prochaska spent her college years attending Oregon State University as a starting catcher. All of these new changes can quite drastically alter a softball program and their methods of going about the game. Obviously, the Seawolves definitely had to deal with quite a bit of rain during their preseason. That translates to lots of field work and indoor hitting. The key word that should be taken from both of their statements is “success”. 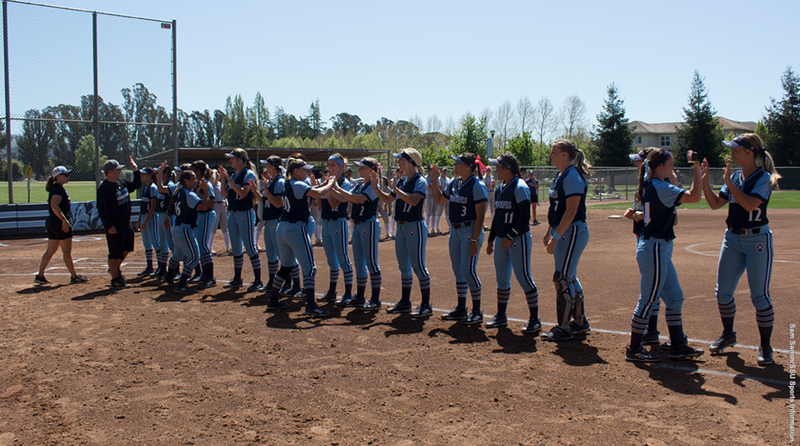 The Sonoma State Softball team has put in a lot of effort to prepare for this upcoming season and it will be very interesting to see the dynamics of this new roster. With good communication and maximum effort, this season should be a great one. Make sure to come out, watch, and support the Seawolves this spring season. Time to rally up the team spirit here on Sonoma State campus to welcome the newcomers and appreciate our returners. The first home games will be against the Humboldt State Lumberjacks on Feb. 8-9. Friday’s games will be at 12 p.m. and 2 p.m. Saturday’s games will be at 11 a.m. and 1 p.m.
You can also check out sonomaseawoles.com for further dates and information on times and locations of the softball games.